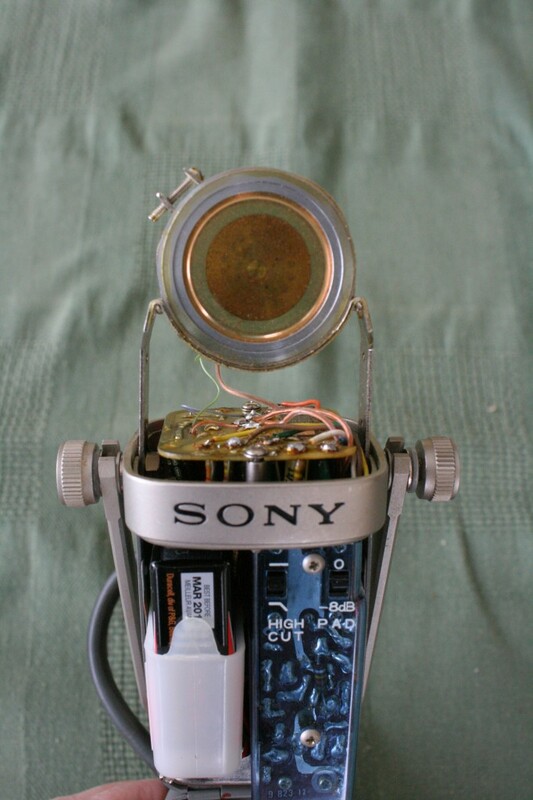 Sony Condenser Mikes From The 1960s. 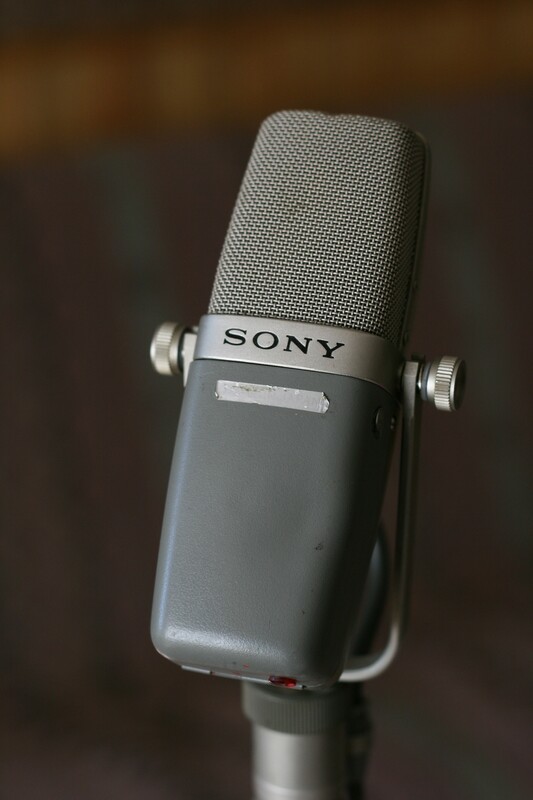 I have this old Sony condenser mike. From the pictures and information I found on the web here, I thought it was a C-37-FET. I don't have the power supply that came with it, so I found circuit schematics to figure out how to hook up the five pin XLR connection. I tried reverse engineering the circuit in the mike, and found it's not quite like the circuit diagram in the C-37-FET Technical Manual (which is available on the above web site). Eventually I realized that it is in fact a C-38A (or B?? ), a 1969 update of the C-37 mikes! There isn't much info available on this mike - it seems quite rare - and I'm not sure all of the information I've found on the web is completely accurate. Apparently this mike has been used at Abbey Road studio to record the Beatles, and Herb Alpert's trumpet on A Taste of Honey:article here. Update 2010.11.05: new information I have received indicates that my mike is almost, nearly, just about, absolutely for sure a C-38B. I did get the mike working by building a simple five-pin to three pin XLR converter. 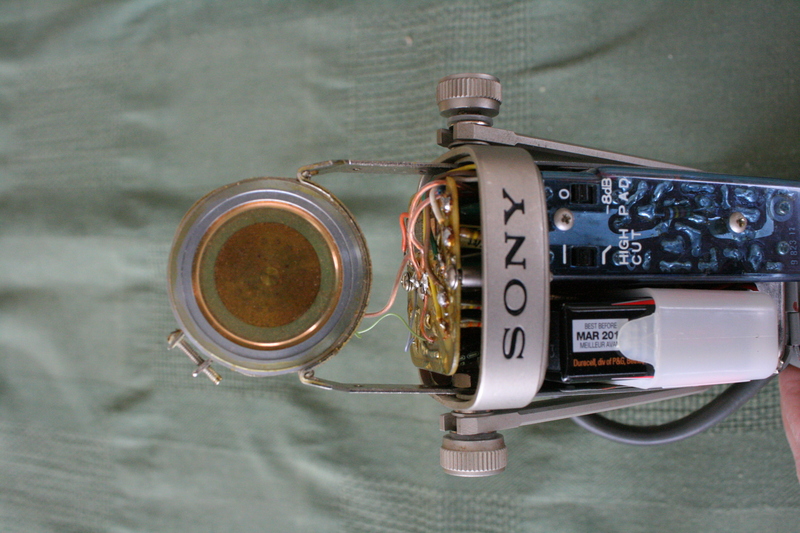 The mike can be operated with a 9V battery inserted or an external 9V power supply. Both of these methods can be remotely switched. I suspect it also can run from phantom power since there is a centre tap off the transformer that feeds the powering circuit. But I need to verify that there is a voltage regulator that drops 48 VDC to 9VDC so the DC-DC converter doesn't get fried. The information I found on the web suggests the C-38B, made in 1971, was modified to be used with phantom power. I'm almost sure that this one is not a C-38B, because it seems the C-38B has a three-pin XLR connection, while mine has a five-pin. The guy I got this from has the exact same mike with the power supply and the storage box with the model number on it (C-38A). Turns out his is a C-38B - but the box is from a C-38A! There a few differences between the C-37-FET and the C-38B. 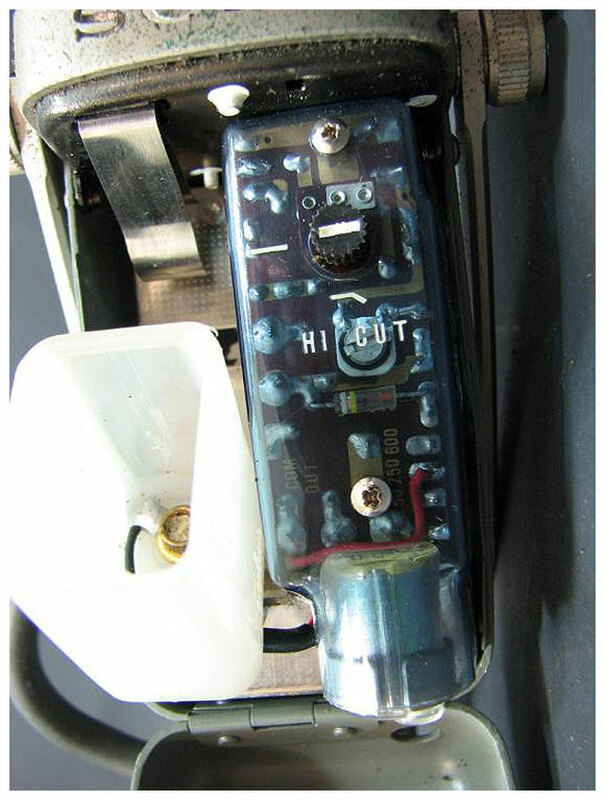 The switch on the C-37-FET can be set to BAT to check the condition of the battery. On the C-38B, the switch is mechanically blocked from going to that position. So don't bother trying (I did). The internal circuitry is somewhat different, but I haven't completely traced out the schematic yet. There are differences in the two internal switches (high cut and 8 dB pad) - see the pictures below. The C-37-FET pictured doesn't have a pad switch. 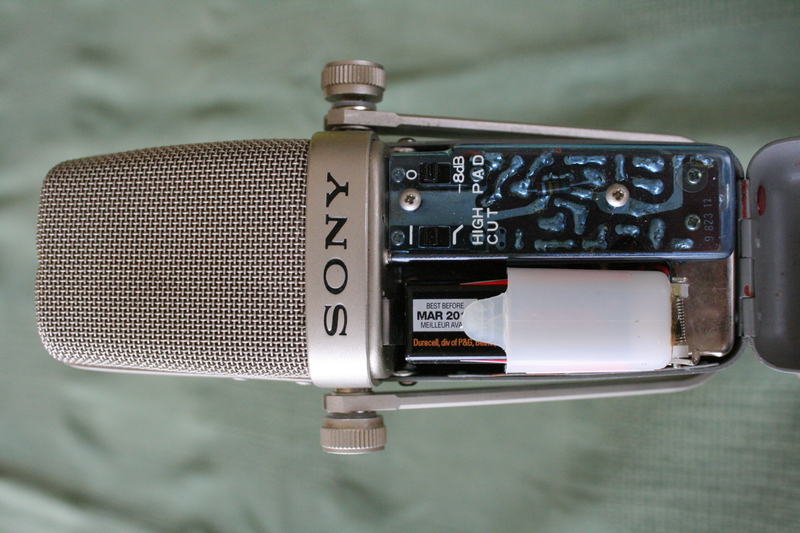 Sony C-38B - internal view. 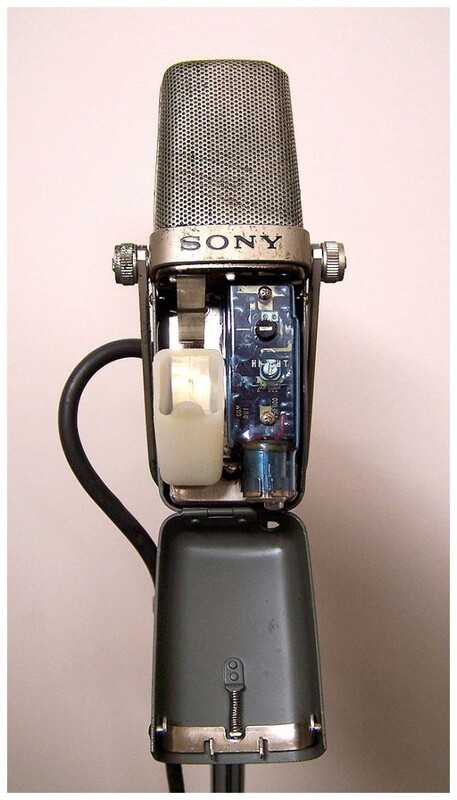 Sony C-37-FET - internal view (from www.coutant.org). 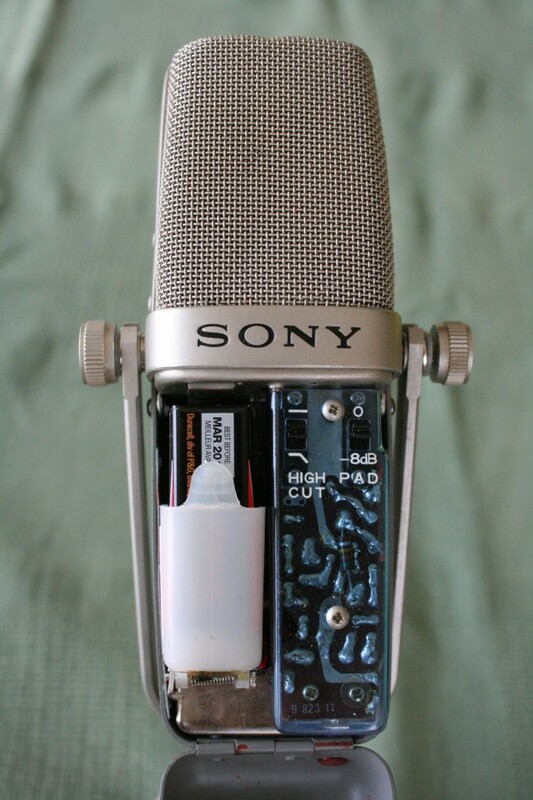 Sony C-37-FET - close up internal view (from www.coutant.org). Sony C-38B inside the headbasket. 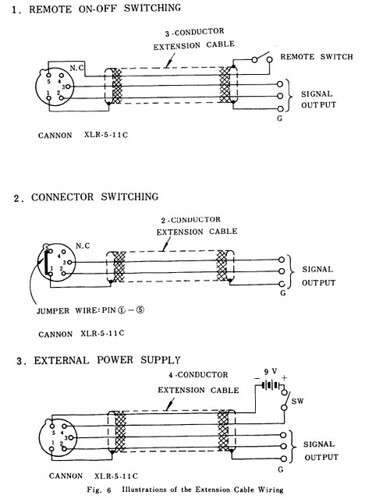 Below is the powering diagram from the C-37-FET Technical Manual, which also works with the C-38A/B. Option 1 uses the internal 9V battery, and the switch allows you to turn it off remotely. The switch on the mike has to be on. Option 2 uses the internal 9V battery and has the mike on any time the connector is connected and the switch on the mike is on. This is how I wired my connector gizmo. It seems option 3 is slightly wrong. The jumper between pins 1 and 5 is also necessary here (or connect pin 5 to the shield - same difference). C-37A: A tube condenser mike introduced by Sony in 1958 intended to compete with the Neumann microphones. Because of the tube circuitry it requires a special external power supply. C-37P: A FET version of the mike that can be powered with 48VDC to 54VDC phantom power. C-37-FET: Made in about 1965, it's a version of the C-37A that uses a field effect transistor (FET). It can be powered with an internal 9V battery or an external 9VDC power supply. It has a five pin XLR connector for powering and remote switching. C-38: I'm not too sure about this one, if it existed. It could be simply a re-labelling of the C-37-FET, or people just dropped the 'A' when referring to it. One source says that the C-38 and the C-37-FET are the same: the C-38 was sold in Japan and the C-37-FET was sold in the US. Update (2010.10.29): I found pictures and some brief information on the C38. It was built in 1965 and the windscreen design is quite different from the C-38A and B. It looks like the C-37-FET inside and out from the photos, but I have no documentation on the C38 to verify if the two are identical. C-38A: An update of the C-37-FET, introduced in 1969 with a new windscreen design. It has a five pin XLR connector for powering and remote switching. Can be powered by an internal 9V battery or an external 9VDC power supply, and possibly phantom power (I will try to verify this). Update 2010.11.05: A service manual I have obtained (copyright 1980) for the US indicates that the C-37-FET and the C38A have the same internal circuitry. No phantom powering! C-38B (1971): An update of the C-38A, introduced in 1971. I think it had a three five pin XLR connector (not sure - I have no documentation). Can be powered by an internal 9V battery or 24VDC to 54VDC phantom power. C-38B (1977): A further update of the C-38B. According to a service manual I have found, it has a three pin XLR connector. It can be powered by an internal 9V battery or 24VDC to 54VDC phantom power. C-38B (2003): Sony re-released the C-38B in 2003. Can be powered by an internal 9V battery or 24VDC to 48VDC phantom power. If you have any information about any of these mikes, or corrections to the above, please send it to me, especially the C-38A and C-38B (original) since that information is quite rare. This blog entry has become a little messy with corrections, so I plan to write an updated entry with the most complete information I can find. Owner's manuals and schematics would be great. Thanks! Edit: Apparently this mike is the classic Manzai mike in Japan (thanks ratite!!). See this.